As the business world becomes more competitive, it is becoming more and more important for business owners to have websites. It used to cost a ton of money to build a professional website, but thankfully, WordPress and companies like InkThemes are making it much easier. Today, you can build professional websites within minutes, for a fraction of the cost it would take to hire a developer. InkThemes, commonly referred to as Ink Themes, is a WordPress theme developer with a knack for creating beautiful themes. They create themes and templates in all niches, but they have quite a few WordPress restaurant templates in their library. In total, InkThemes offers 34 unique and customizable themes, so no matter what niche you’re looking for, you’re sure to find a theme that fits your needs and your business perfectly. Plus, several generic themes offered are flexible enough to be used for just about any application. Most of the WordPress restaurant templates that InkThemes offers are not specifically designed for restaurants, but can easily be adapted to fit the needs of a growing restaurant or café. In fact, these templates could be adapted to fit a number of different businesses. 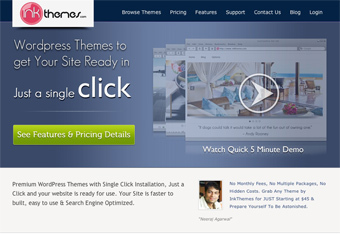 Plus, InkThemes makes it super easy to set up your website – all of their themes have a 1-click install! And once the theme is installed, it’s simply a matter of adding the content you want to display on your site. Last but not least, InkThemes has a dedicated support forum for members. If you have any issues with the theme, you can go to the support forums to find answers – both from InkThemes staff and fellow business owners alike. With this great level of support, there is truly nothing to fear when making a purchase from InkThemes!